Since the day when people don hockey masks and harass teenagers, Halloween, is nearly upon us, we can also expect a slew of themed events in games. Even game’s that haven’t even launched. 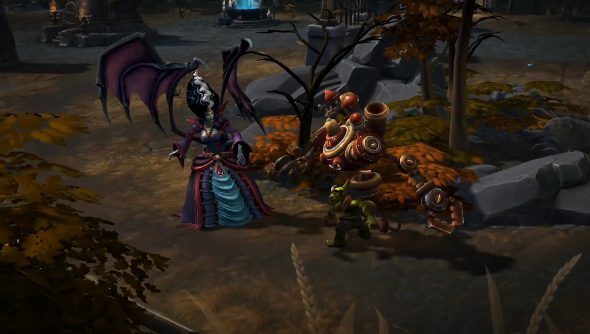 Heroes of the Storm’s acknowledging that it is in fact almost Halloween by sprouting three new skins, so you can run around killing things while looking only marginally more ridiculous than you did before. Especially if you have that magical little pony. Kerrigan’s all done up like a Hammer Horror monster with the Countess Kerrigan skin, with the hair of the Bride of Frankenstein and the wings of a demon. Abathur’s wormy body is now attempting to hold up a giant cracked skull with its brain poking out in the Skelethur Abathur skin. And finally there’s the first Legendary skin, Infested Tychus: half marine, half gross. Blizzard’s expanding the technical alpha at the moment, and there are now a couple more ways for you to get access to the work in progress.